Ken R. Blawatt, BSc (ME), Manitoba; MBA, York University; PhD, Cranfield University, U. K., is a seasoned, well published professor of entrepreneurship, marketing and strategic management. He is currently adjunct professor at Arthur Lok Jack Graduate School of Business. After retiring from Simon Fraser University and Thompson Rivers he has spent the last few years teaching at Universities in the Caribbean and developing entrepreneurial programs. Dr. Blawatt has also lectured in Estonia, in northern India and the United States. His publications include a text in Entrepreneurship, published by Prentice Hall 1997, Marketing Basics for the Caribbean, published 2004 by Randle Publishing, Jamaica and Marketing for the Technical Entrepreneur, Waterloo University publications, 1978. 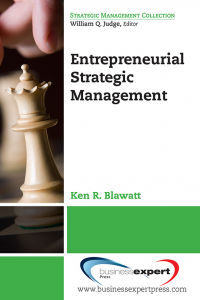 His new book in Strategic Entrepreneurial Management was released May 1st 2014, published by Business Expert Press.